“We developed the Education Stimulus Plan two years ago to address the key concerns of parents and students who seek for a globally recognized education with strong outcomes for greater employability prospects,” said Timothy Johnson, Senior Vice President, Marketing, Products and Partnership, INTI International University and Colleges. “The result of that includes the story of Madam Selvi, who is one of many proud parents who has sent their children to INTI and came out satisfied, as well as Jake Choy, an INTI alumnus who is now an upcoming Digital Consultant,” he added. The 30 seconds video of Madam Selvi talks about her daughter Sangeetha who is currently pursuing her Diploma in Business at INTI. The 30 seconds video of Madam Selvi talks about her daughter Sangeetha who is currently pursuing her Diploma in Business at INTI and how choosing INTI has been one of her best decisions. “INTI gave us an opportunity – giving simple children from simple families to go to college. The higher educated you are, the better you are in seeking a job,” she said. Jake Choy, a graduate of Business Administration from Northwood University at INTI International College Subang attributed his success and flourishing career to his time at INTI, and specifically his stint as a Broadcast Anchor at World Business Forum at Mexico – a collaboration made possible due to INTI’s linkage with the Laureate International Universities network. 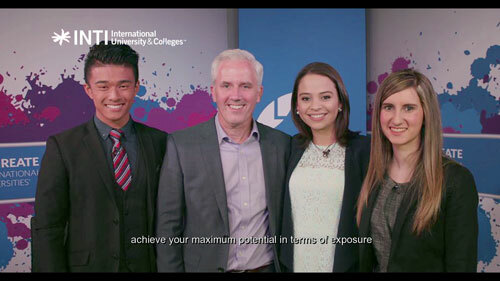 Jake Choy, attributed his success and flourishing career to his time at INTI, and specifically his stint as a Broadcast Anchor at World Business Forum at Mexico. This is also further enhanced by its’ latest collaboration with IBM Malaysia to introduce the IBM Innovation Center for Education (ICE) program with the undergraduate programs and academic courses for the Computing & IT and Business verticals in INTI.